Gov. Greg Abbott advocates for an even stronger Texas economy. Gov. 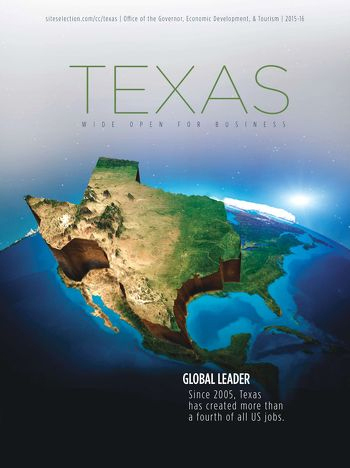 Greg Abbott addresses the Greater Houston Partnership in February 2015.
ite Selection magazine ranked Texas No. 1 in corporate facility performance for 2014.
Business Insider said Texas boasts the second strongest economy in the nation. Non-farm payrolls grew by 4.4 percent from December 2013 to December 2014 — the second-highest growth rate in the country. With a performance like that, what does a state do for an encore? If you’re Texas Gov. Greg Abbott, you take nothing for granted and then push for more. That was his central message in a recent interview with Texas Wide Open for Business. Saying that he will not rest on the laurels of his predecessor, Abbott vowed to fight for an even stronger Texas economy during his term as governor. The following are the highlights of that conversation. Your state has enjoyed 58 consecutive months of year-over-year sales tax growth. To what do you attribute this record-setting economic growth, and what must your state do to sustain it? Governor Greg Abbott: The economic success Texas enjoys today ultimately stems from our greatest natural resource — the people of Texas. In every aspect of life, Texans value freedom more than anything else. It’s in our DNA, and it is reflected in our business climate. As governor, I will work to ensure that employers are free from the burdens of over-taxation and over-regulation, and that entrepreneurs are free to start a business without government hurdles standing in the way. That type of environment is attractive to employers and workers in any industry, and that’s why Texas has been able to sustain growth that is broad, deep and diverse. You said in your Feb. 17 State of the State Address, “We need to expand and support our community colleges that serve as the gateway to better jobs and as a step toward further education opportunities.” How do you plan to do that? Gov. Abbott: Just as with primary and secondary education, higher education doesn’t work in a one-size-fits all approach. Different students have different needs, and our employers are demanding that we better prepare our students for workforce needs. For many, a two-year degree is far more than a piece of paper. It’s a key that opens the door to economic freedom. During my campaign for governor, I outlined a plan to make our higher education system more affordable, accessible and accountable, which includes several proposals that will expand access and increase value at the community college level. My plan includes making core freshman and sophomore courses more consistently transferable between community colleges and public four-year institutions. This will give students greater flexibility, as well as adopting block scheduling for all two-year degree programs for greater predictability. We need to expand and support our community colleges that serve as the gateway to better jobs and as a step toward further education opportunities. Your budget this year allocates a half-billion dollars to enhance research programs and attract top researchers to Texas universities. How does an investment like that impact economic development? Gov. Abbott: It’s no coincidence that some of the top-ranked public universities in the US are located adjacent to Silicon Valley. The high tech industry grew organically around these universities as researchers took their innovations out of the lab and into the marketplace. Texas will continue to make meaningful and effective investments in job creation. Now, we must also harness our resources to elevate Texas’ higher education institutions as integral participants in our economic advancement. I’ve put forth a plan to establish the Governor’s University Research Initiative that will enhance Texas’ ability to recruit nationally recognized researchers, promote economic development and serve as a significant step toward ensuring Texas is home to five of the top 10 public universities in the nation. My University Research Initiative will provide matching funds to help Texas institutions of higher education recruit top researchers and Nobel laureates to their faculty, which will simultaneously elevate Texas’ public universities and serve as a catalyst for economic development. Your budget this year also adds more than $4 billion a year to build more roads in Texas without raising taxes, fees, tolls or debt. Why is that important? Gov. Abbott: We need to ensure that Texas has the transportation infrastructure in place to support the tremendous growth we’ve seen over the past decade. Every day, 1,000 people move to Texas from other states, and this rapid growth has added strain to our system of roads. Every minute wasted in traffic costs Texans time and employers money. That’s why I’ve proposed investing an additional $4 billion a year to improve our roads, so people, goods and commerce can more efficiently move across our great state. Your budget also exempts new businesses formed by veterans from paying state registration fees and franchise taxes. How will this assistance bolster your state’s economy? Gov. Abbott: Texas can continue to improve its job creation climate by lowering the barriers to entrepreneurship for our large population of military veterans. One way I want to achieve that goal is by waiving licensing exams and fees for veterans who have received technical training in the military, because if the training is good enough for the Armed Forces it should be good enough for Texas. Removing these barriers will encourage Texas veterans to put their valuable skills and experience to use in starting businesses and creating jobs. You pledged to make the Texas Enterprise Fund “more efficient, more effective and more transparent to help grow even more jobs in Texas.” How do you plan to do that? Gov. Abbott: Texas is the national leader in economic development and job creation, but there is more we can do and ways we must improve. As governor, I have acted swiftly to ensure that we are evaluating all economic development programs to ensure they are running efficiently, effectively and that Texans see a clear return on investment for every dollar of taxpayer money we spend. We need to assess, improve, and in some cases, restructure the economic development tools that have helped make Texas the national leader in job creation. When Texas introduced the Enterprise Fund concept more than a decade ago, it was groundbreaking. But other states have followed suit and they’re working diligently to compete with us. That means we must make our economic development efforts bigger, broader and bolder, and be much more aggressive in attracting companies and foreign direct investment so that we become not just the national leader, but a world leader in job creation. Just as importantly, I’m working with lawmakers to dramatically improve transparency and accountability with our incentive programs. Taxpayers deserve to know that their money is being well spent, and that any award will be based solely on merit. Your budget plan calls for reducing the business franchise tax and property taxes. How much will businesses save under this plan, and how will this help the Texas economy? Gov. Abbott: Texas’ low tax burden is one of our greatest assets when it comes to attracting jobs, but I believe we can make it even better. I’ve asked lawmakers to permanently reduce the business franchise tax by $2 billion, and I’ve made it clear that I will veto any budget that doesn’t include genuine tax relief for employers. I’ve also proposed a $2.2-billion property tax cut for all property owners, including employers. In Texas, we want businesses to invest their capital in jobs, research and growth, not government. What is the biggest misperception about Texas? Gov. Abbott: Many people think everyone in Texas is either a cowboy or a caricature of J.R. Ewing. 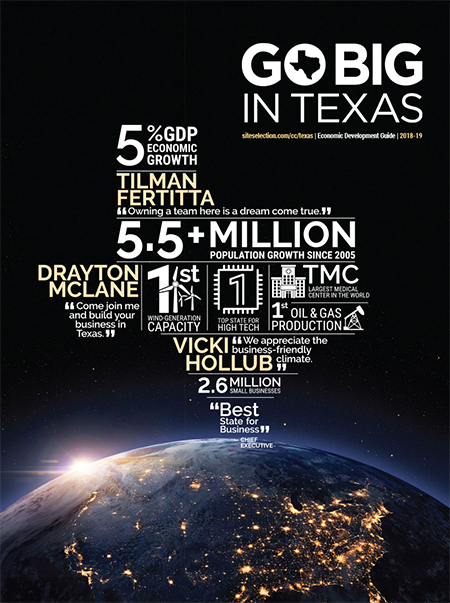 The truth is, the Texas economy is one of the most diverse in America and the 12th largest economy in the world. We’re experiencing major growth in technology, manufacturing, finance and every other sector. Texas leads the nation in so many areas. We’re No. 1 for everything from energy production to exports to agriculture, and we’re only getting better. One Texas stereotype that I will acknowledge is true is that everything is bigger in Texas — even the future! The Bullock Texas State History Museum in Austin tells the story of Texas.